In this very straightforward study, the authors point out the mistake of thinking that interventions should be the same for all readers in the poor reading group. Children with dyslexia and children with a more generalized language disorder have different learning needs, but they can't be distinguished by comprehension alone. 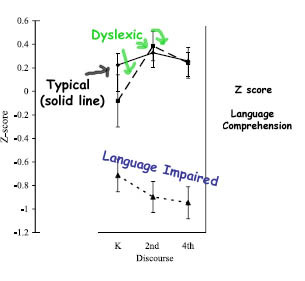 Excerpt: "...poor comprehenders and poor decoders may be less clearly differentiated on the basis of reading comprehension in the early grades..." If you look at the course of oral reading ability and passage comprehension, the poor decoders (dyslexic impaired phonology, isolated word reading) are more likely to spurt ahead of the more globally language impaired students between the 2nd and the 8th grades. This dyslexic spurt is the norm for dyslexics, rather than the exception. 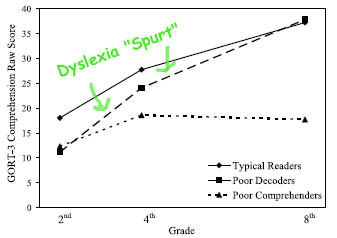 Many dyslexics are quintessential "late bloomers", and they need to be encouraged as such (rather than parents and students being burdened with depressing and apocalyptic visions of being imprisoned, etc.). The needs of phonological dyslexics and language-impaired readers are just different. 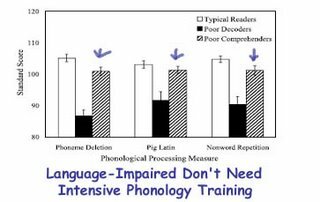 Many students with generalized language impairment don't need intensive phonemic awareness training. 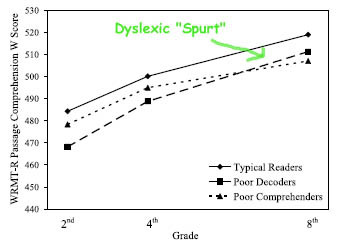 BTW, there's also an interesting figure (below) that shows that at the higher grades, the poor decoders / phonological dyslexics matched and sometimes exceeded the performance of typical readers. This was on the subtest of discourse comprehension, an assessment involving higher-order language comprehension ability and inference. Cool, huh?